Outstanding opportunity to get into one of the premier locations in the downtown/ Little Italy area. This is a corner location with great visibility but without the corner rent factor. Located in the heart of the downtown/ Little Italy area this is a premier location that rarely becomes available. Restaurant owner opened up over 10 years ago and has been going strong for years. Having been in the restaurant business for 30 plus years the owners are ready to step aside and hand this great restaurant space over to the next generation. Building owner (landlord) is very tenant friendly and now is the time to capitalize on this chance to buy a turnkey restaurant in an area that continues to boom and expand. Current concept is doing very well; restaurant is California chic with full floor to ceiling windows on two sides, creating an inviting and active atmosphere that customers love. There is a very nice patio area for diners to enjoy the beautiful scenery and San Diego weather. Verifiable top line sales for the past three years have averaged nearly 600k. Net income for the same three years has averaged over 70k at the bottom line. Lots of opportunity to increase sales/bottom line for new owner willing to increase hours. Keep the current very well received and reviewed concept or buy it and convert to your own concept. The choice is yours! 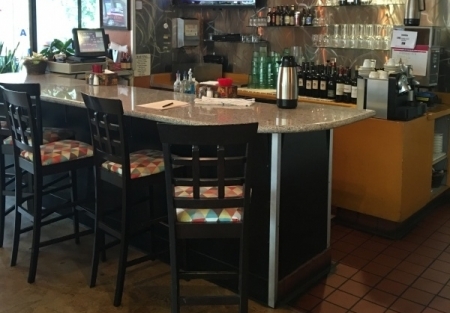 Open kitchen and two separate bar/seating areas in addition to the beautiful dining area, bring this restaurant to life; you really need to see the place to appreciate all that it has to offer. If you want to bring your own concept to a turnkey location this would be the ideal time and location. Save the huge time, hassle and expenses associated with building out a new restaurant, depending on the changes you wanted to make you could be open for business here in a matter of weeks. Restaurant space is 2050 square feet plus the outside patio area and several large storage areas that are yours to use but not included in the sq. footage total. You will be hard pressed to find a rent like they have here and the space is under lease for the next 15 plus years. Current lease term expires in Jan of 2022 with two five year options available. The space is locked up for a long time. Rent is only $4132 per month plus $400 CAM fee. Rent factor well under 10% of gross sales. Come take a look today by going to www.sellingrestaurants.com to see if this is the restaurant you have been waiting for.